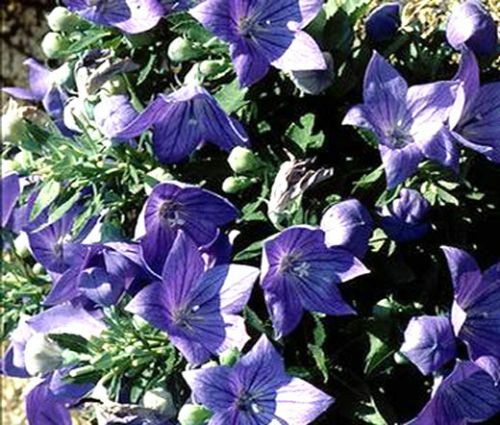 Balloon Flower Blue Platycodon Grandiflorus is an easy to grow from seeds, clump-forming perennial. Also known as Chinese Bellflower, the plant produces the uniquely shaped balloon-like buds that eventually unfold and form showy star-shaped blue flowers with five petals that are fused together. The dark-green foliage and strong stems are other attractive features of this flower. Balloon Flower blooms extensively in mid to late summer, when many other perennials are already faded. The fragrant flowers attract hummingbirds, butterflies, and bees. Balloon Flower Blue is a cottage garden favorite that is great for edging borders, rock gardens and looks beautiful in containers and window boxes. Platycodon Grandiflorus can be grown in full or partial sun, and well-drained soil is preferable. Chinese Bellflower is a very drought tolerant and care-free, long-lived perennial that can re-seed itself, if conditions allow. Balloon Flower is an outstanding cut flower.